Kimi Raikkonen is the first race driver to be confirmed as taking part in next week's 'young driver' test. Race drivers are allowed to run for one day of the three-day Silverstone test from 17-19 July to evaluate new tyres. Pirelli has produced a new design aimed at eradicating the problems that led to a series of dramatic failures at the British Grand Prix last month. Sauber will use Nico Hulkenberg for one half day. No other team has yet said if their race drivers will take part. Raikkonen will drive on Friday, the final day of the test, with Frenchman Nicolas Prost - the son of four-time world champion Alain Prost - driving on Wednesday and reserve driver Davide Valsecchi on Thursday. Sauber will split the rest of its programme between reserve driver Robin Frijns and Japanese former Formula 3 driver Kimiya Sato. 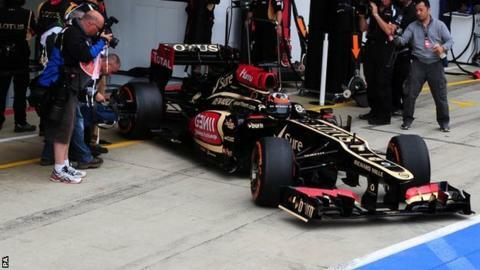 Lotus trackside operations director Alan Permane said: "We have a lot planned across the three days. Obviously we want to give all three drivers the maximum track time possible as well as assessing the latest upgrades to the car. "Our aim on the third day will be to help Pirelli understand the latest changes to their tyres at the same venue where they most notably had issues this season. "For Nico and Davide it's an opportunity to learn and improve, while for the team it is a great opportunity to try to refine some of the latest developments we have for the E21 [car]. "Kimi is also allowed to run, enabling him and other race drivers to test tyres for Pirelli. This will benefit both him and Romain [Grosjean, the other race driver] by granting us a better understanding of these tyres before we head to the next event in Hungary." Williams are expected to run their development driver Susie Wolff for her first full test in an F1 car. The 'young-driver' test is an attempt to allow teams to try out drivers who have not yet raced in F1 - the rules dictate that those taking part must have competed in no more than two grands prix. But this stipulation was waived following the problems at the British Grand Prix to allow Pirelli to try out its new tyre design on the track that had caused the most problems. A series of problems all contributed to six drivers suffering blowouts during the race. Although Pirelli said the manner in which the teams were operating the tyres was partially to blame, the biggest single cause is believed to have been a weakness in the construction of the 2013 tyre at the shoulder, where the sidewall meets the tread. Pirelli has decided to revert to the construction used in 2012, which has a stronger shoulder, from the Hungarian Grand Prix, but combined with the softer rubber compounds used so far in 2013. As there were no similar problems last year, none are expected with the new design, but the Silverstone test gives Pirelli a chance to make sure before the teams reach the races at Spa in Belgium and Suzuka in Japan, which make even more extreme demands of the tyres. Mercedes will not feature at the test because of their ban for taking part in the controversial Pirelli tyre test.